Aided by Robert J. Brugger, Maryland: A Middle Temperment, 1634-1980 (Baltimore & London: The Johns Hopkins University Press, 1988). Captain John Smith, engraving by Simon van de Passe, 1616, Havre de Grace Maritime Museum, 100 Lafayette St., Havre de Grace, Maryland, June 2015. Photo by Sarah A. Hanks. 1608, June 2 & July 24. Capt. John Smith (1580-1631) led two voyages exploring the Chesapeake Bay. c. 1620. Earliest appearance in Maryland of European objects in archeological context. 1629. George Calvert (1578/9-1632), 1st Lord Baltimore, sailed from Newfoundland to Virginia. 1631. Kent Island trading post and farming settlement established by William Claiborne (1600-c. 1677), member of Virginia council. 1632, June 20. Maryland Charter granted to Cecilius Calvert (1605-1675), 2nd Lord Baltimore, by Charles I, King of Great Britain and Ireland. The colony was named Maryland for Queen Henrietta Maria (1609-1669), wife of Charles I (1600-1649). Charles I, King of England, Studio of Anthony Van Dyke, c.1640 (MSA SC 1545-1099). Courtesy of Commission on Artistic Property, Maryland State Archives. 1633, Nov. 22. English settlers on Ark and Dove set sail from Cowes, England, for Maryland. 1634, March 25. Landing of settlers at St. Clement's Island (Maryland Day). Calvert party celebrated Feast of Annunciation (March 25); later purchased Indian land, and built "Fort at St. Mary's City." "Daily Life in the New World, 1634-1715"
1634/5, Feb. 26. First General Assembly (law-making assembly of freemen) met at St. Mary's City. 1635. Proprietary vessels clashed with those of William Claiborne (1600-c. 1677). 1635, Sept. 8. A Relation of Maryland published by Jerome Hawley and John Lewger (London). 1636. Leonard Calvert House (later, Country's House), East St. Mary's, served as state house and governor's residence. 1637. St. Mary's County first cited in provincial records. 1638. Assembly claimed protections of English law; Assembly and courts met at John Lewger's St. John's. 1639. First elections in province for delegates to Assembly ordered by Governor Calvert on Kent Island, and in hundreds (political subdivisions or districts) of Mattapanient, St. Michael's, St. Mary's, and St. George's. 1642. Kent County first cited in records of commissioner appointments. 1643-1644, Oct. Giles Brent, acting provincial governor. 1645, Feb. 14-1646, Dec. Ingle's Rebellion: Richard Ingle led rebellion against proprietary government. 1646, Dec.-1647, June 9. Leonard Calvert, governor. 1647/8, Jan. 21. Margaret Brent (c. 1601-1671) denied right to vote in General Assembly. 1649. Governor Stone invited Virginia Puritans to settle in Maryland. 1649. Town of Providence (later Annapolis) founded. 1649, April 21. Religious toleration law (An Act concerning Religion) enacted. 1650, April. Anne Arundel County created (Chapter 8, Acts of 1650). 1650, April 6. General Assembly divided into an upper and lower house. 1652, March 29. Parliamentary commissioners displaced proprietary regime. 1652, July 5. Susquehannocks sign treaty at Severn River, ceding Eastern Shore and Western Shore lands (except Kent Island & Palmer's Island) to English. 1654. Patuxent County (later Calvert County) formed by order in council. 1655, March 25. Puritans from Virginia defeated Gov. William Stone's forces at Battle of the Severn. 1656. John Hammond's Leah and Rachel, Or, the Two Fruitfull Sisters Virginia and Maryland published (London). 1657, Nov. 30. Oliver Cromwell (1599-1658) restored Maryland colony back to Calverts. Lord Baltimore's claim to Maryland reaffirmed. Lord Baltimore reestablished proprietary authority. 1658. Lower House voted to compose itself of four delegates per county, elected by freemen. 1658. Charles County created by order in council. 1659/60, Jan. 12. Baltimore County known to have been established by this date, when a writ was issued to county sheriff. 1660. Bohemia Manor established by Augustine Herrman (1656-1697). 1661/62, Feb. 18. Talbot County known to have been established by this date, when a writ was issued to county sheriff. 1663. Augustine Herrman (1656-1697), first naturalized citizen of Maryland. 1664. Slavery sanctioned by law; slaves to serve for life. 1664. Construction on Secretary's Office or Council Chamber (later van Swearingen Ordinary), St. Mary's probably begun by this date. 1666. Somerset County established by order in council. 1666. Assembly agreed to 1-year "stint" on tobacco growing, but Lord Baltimore vetoed bill. 1667. St. Mary's City incorporated. 1668/69. Feb. 16. Dorchester County known to have been established by this date, when a writ was issued to county sheriff. 1670. Voting restricted by Governor to planters with 50-acre freehold or property worth 40 pounds; officeholding restricted to owners of 1,000 acres. 1670. 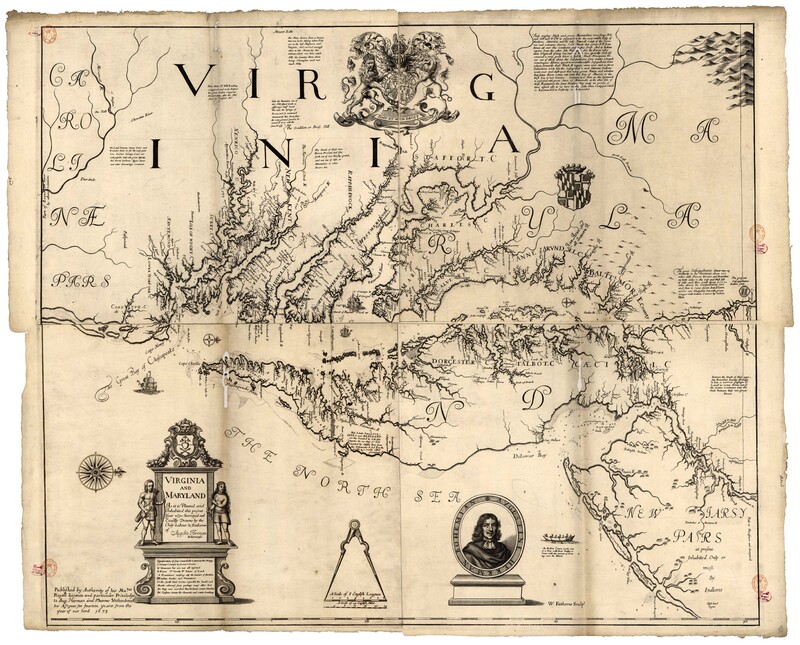 Authoritative map of Maryland (engraved, London, 1673) completed by Augustine Herrman (1656-1697). 1672, Oct. George Fox (1624-1691), founder of Religious Society of Friends, preached in Anne Arundel County. Friends form Maryland Yearly Meeting. 1672. Cecil County erected from Baltimore and Kent counties by proclamation of Governor. 1675-1677. Maryland and Virginia war against remaining Susquehannocks. 1676. Brick state house completed at St. Mary's City. 1676. In Lower House, Proprietor limited delegates to two per county. 1679. Philip Calvert (1626-1682) began construction of St. Peter's, largest brick structure in province. 1679-1684. Charles Calvert, 3rd Lord Baltimore, governor. 1679. Governor granted county courts jurisdiction over civil suits. 1681. Josias Fendall (c. 1628-1687) found guilty of conspiracy by Provincial Court, which fined and banished him. 1682. Quakers began building Third Haven Meeting House (completed 1684), Talbot County. 1683. Assembly passed Act for Advancement of Trade (town act). 1683. Labadist community settled at Bohemia Manor. 1683, May 15. Proprietor replaced headright system of land grants with "caution money" or outright purchase. 1684. Cambridge on Choptank River laid out by commissioners. 1684. Presbyterians under Francis Makemie (1658-1708) built church at Snow Hill, first in colonies. 1684-1689. Council of deputy governors ruled Maryland in the name of child Benedict Leonard Calvert. 1685, Aug. 31. Printing press of William Nuthead (c. 1654-c. 1695) used at St. Mary's City by this date. 1689, July-1690, May. Maryland Revolution of 1689. Protestant Associators overthrew proprietary officers. 1690, May-1692, April. Interim government of Protestant Associators. 1692, April-1715. Crown rule; William and Mary declared Maryland a royal colony and appointed Sir Lionel Copley governor. Maryland governed as a royal colony rather than as a proprietary province. 1692. Church of England made the established church. Royal assent to establishment act given in 1702. 1693, Sept. Sir Thomas Lawrence, governor. 1693-1693/94. Sir Edmund Andros, governor. 1694-1699. Sir Francis Nicholson, governor. 1694/5, Feb. Capital moved from St. Mary's City to Anne Arundel Town. Governor Nicholson laid out plan for capital city. 1695, May. Anne Arundel Town renamed Annapolis. State House, Annapolis, Maryland, May 1999. Photo by Diane P. Frese. 1696. Construction began on new state house and probably on St. Anne's Church, Annapolis. 1696. King William's School (later St. John's College) founded at Annapolis by Governor Nicholson and others. 1698. Construction completed on State House, Annapolis. 1698. Monopoly of slave trade by Royal African Company abolished by Parliament; slave imports markedly increased. 1698. Kent County courthouse moved from New Yarmouth to New Town (later Chestertown). 1699-1704. Nathaniel Blackiston (or his appointee), acting governor.